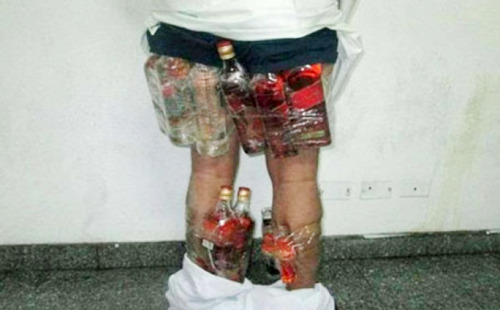 This is the extreme lengths that one man in Saudi Arabia went to for a drink – smuggling 14 bottles of liquor into his underpants. But alcohol is strictly forbidden in the country under strict Islamic law – and the man now faces a public lashing, alongside a lengthy jail sentence. It’s believed that the man was returning from Bahrain – where booze is not illegal, and was caught on the King Fahd causeway that links the two countries with the bottles concealed under his robes. But the problem of liver disease among those who head for Bahrain in search of a drink has now become so high that UK and American specialists are drafted in to treat the problem in state of the art hospitals. Authorities are usually believed to take a softer approach to expatriates drinking in Saudi Arabia – as long as it is consumed in sealed quarters. Another option is to make booze yourself – an endeavour which previously saw British expatriate Karl Andree facing the prospect of 350 lashes for making wine before he was eventually pardoned.